Unknown 4:26 PM Day trek to Siddarabetta. After getting amazing reviews from a friend about BTC and the whole trekking experience. 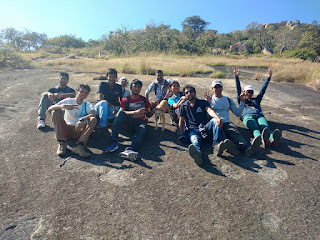 I registered for my first trek ie siddara betta. So as decided we had to reach santhala silk at 7 am. 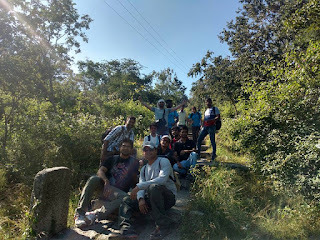 But being my first trek i was very excited and reached there at 6:45 am. I saw there vikram waiting for everyone and to my surprise everyone was right on time. All 12 of us left in the TT at around 7:15 AM. As the journey started vikram told us about this unique tradition where everyone had to give intro by enacting there name. This was an amazing way to interact with everyone and get to know each other better. After the intro session we ended up playing Dumb charades for the rest of the journey which was too much fun. We reached our destination at around 9:30. And then we started trekking. At the start as there were lots of stairs we got tired very soon and so vikram asked us if we want to take a different route to the top instead of the boring stairs. we all agreed at once and it turned out to be the best decision. 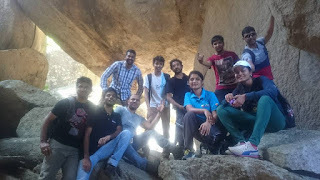 while going through the mountains we encountered lots of caves and it was an amazing experience. At one point we literally had no idea through which way we should proceed and it was kind of very exciting to explore all the new paths through the caves. At some places it looked like we are the first ones going through that path. It took us almost 2 hours to reach till the top where there was a temple inside a cave. After entering inside the temple pundits were pouring 3 jugs of pure water over your forehead. We heard stories that when hanuman was carrying sanjeevani he dropped few of it over that place and that’s why the place is so pure. The taste of the water over there was so good that we filled our bottles with it. It was around 12:30 and we got hungry so we decided to sit under a secluded place under the rocks and have our lunch. As decided we were doing potluck so we all had brought lunch box. I bought the only thing which i know to make which is Maggi and i was so happy that everyone loved it. Everyone bought delicious food like curd rice, gazar ka halua, gulab jamun, bread jam :P. we had awesome time sharing and eating food. After that since we had time left so we started playing mafia. Playing on the top of the hill sitting on the rocks was a totally different experience. We played till 4 PM and then we decided to descend down. As going down through the caves was a little risky so while heading down we chose stairs and it took us not more than an hour to reach the foothill. Finally after the awesome trekking experience we decided to head back. While on our way to Bangalore we played Antaakshri for almost 2 straight hour. I was actually amazed to see the awesome collection of old hindi songs by vikram, sohail and kavita which was never ending. And finally we reached back majestic at around 7 PM where we had our feedback session in which everyone gave the positive feedback. The trek came to an end and we all parted our ways. At the start of the trek i was in a bit of dilemma that how would it turn out as i won't be knowing anyone there but while coming back home all i was thinking was how fast the time flew and my first trek in Bangalore couldn't have been better.